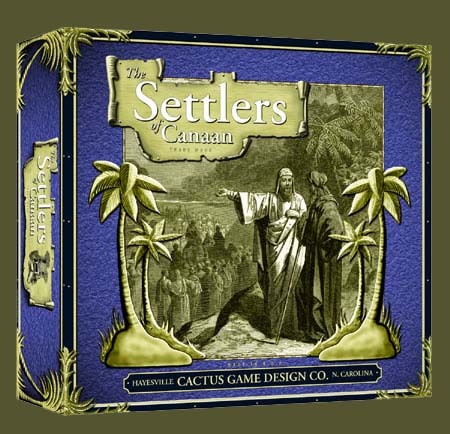 Settlers of Canaan takes place in the territory of Canaan off the coast of the Great Sea. Each Player represents a tribe of Israel as they seek to settle the land of Canaan. The time period of the game spans the time of Joshua's conquests of Canaan (Joshua), the turbulent years ruled by judges (Judges) through the choosing and crowning of King David (I & II Samuel). This was my first game that introduced me to the Catan style gaming. I do not own Settlers of Catan, but I have played a solitaire version on PC. I must say, Settlers of Canaan is a lot better than the basic Catan board game. The extra path to victory by building Jerusalem is a nice feature. Downside is that the board is fixed whereas Catan is random board setup for more replayability. I bought this game on accident, when I first began to play board games. It was a surprisingly good game to have though. It has a great introduction to the style of eurogames. If you want to introduce someone to them pick this one up. Settlers is THE entry game into the world of strategy games. Anyone can enjoy it. The game is ever changing as the board is different every time. There are many expansions & variants to keep everyone interested. It's one of the best out there! I love this Game! It is a great strategy game! If you love strategy games you have to play Settlers! You won't be sorry! This is a historical/religious version of the Settlers of Catan and, though it may be interesting and novel as such, almost lives up to the original's gameplay. I do recommend playing this game, but it isn't quite as good as its progenitor. A classic game....the first euro to really become popular and for good reason...it's simple enough to learn in 5-10 minutes, yet tons of fun and different every time tahnks to the modular board. By far one of my fav games. Just because its not you turn don't mean you don't get to do something. Good game to bring in new people to real board gaming.